Background: The development of vertical lines between the eyebrows is a common aesthetic deformity. It is caused by the expressive action of the corrugator supercilli muscles located at the medial end of the eyebrows beneath the frontalis muscle and just above the orbicularis muscle. Their inward action pulls the skin in the glabellar region inward creating vertical lines. In some people they appear as the classic ‘11s’ but can also appear as one unilateral line or even three vertical lines. Age, skin elasticity as well the level of expressivity of the face also influence the creation and depth of these glabellar furrows. The treatment of glabellar furrows can be done by Botox injections, injectable fillers and various energy devices. By history the emergence and popularity of Botox injections was for the treatment of glabellar furrows. Injectable fillers came along afterwards to help decrease the depth of more established vertical lines, usually in conjunction with Botox injections. Such injectable treatments have proven very effective in superficial and medium depth furrows. But in deep established glabellar furrows that have evolved over the years, injectable treatments often produce limited improvement. The vertical skin lines are deep and relaxation of the muscles at this point makes little difference. 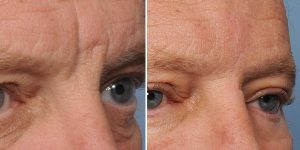 Filler injections to lessen their depth helps a little but often just results in a glabellar bulge with the lines still present. In addition men that have such deep glabellar furrows have little interest in repeated injection treatments that have limited benefit. Case Study: This middle-aged male presented with very deep glabelar furrows that he had for a long time. His 11s were actually 111s with a deeper right furrow, a less deep central furrow and a more superficial left furrow. The overlying skin quality was loose and very mobile. No injectable treatment was going to be effective. 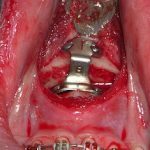 While having other facial procedures under general anesthesia, full-thickness excision of the tissues between the two lateral glabellar furrows was down to bone. 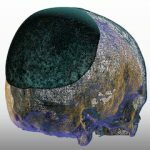 A glabellar bone implant hard carved out of an ePTFE block was made to fit into the valley between the medial brow bone prominences. It was secured into place with two screws. A multilayer soft tissue closure was done over the implant with a midline skin closure. When seen again at one year after his surgery, the glabellar area was completely smooth with a flat contour. In cases of very deep glabellar furrows with sufficient skin laxity, furrow excision is a viable treatment option. A glabellar bone implant is a helpful as it provides a permanent and profound push on the overlying glabellar soft tissue reconstruction. 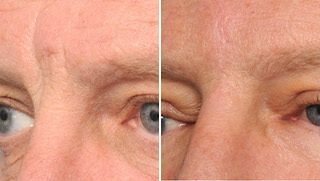 1) Very deep glabellar furrows in men may be resistant to Botox and injectable fillers. 2) The extreme depth of deep glabellar furrows may require their excision in order to level them with the surrounding forehead contour. 3) A glabellar bone implant placed between the inner brow bones prominences can be a useful adjunctive procedure to prevent recurrent glabellar depression.